Pressured to still answer aggressive decks, but on the other hand struggling to find a win condition against the late-game powerhouses Taunt Warrior and Midrange Paladin, the list makes numerous compromises in order to find balance. Elemental Shaman’s early game is weak (Jades help with that if you venture down that road) and I have been forced to cut Flame Plume Harbinger as it does not help enough. It is possible that it could still see play in some pure Elemental Shaman build, but most builds are now Jade Elemental hybrids and there it simply lacks enough targets, and I could not fit it in this pure build either. 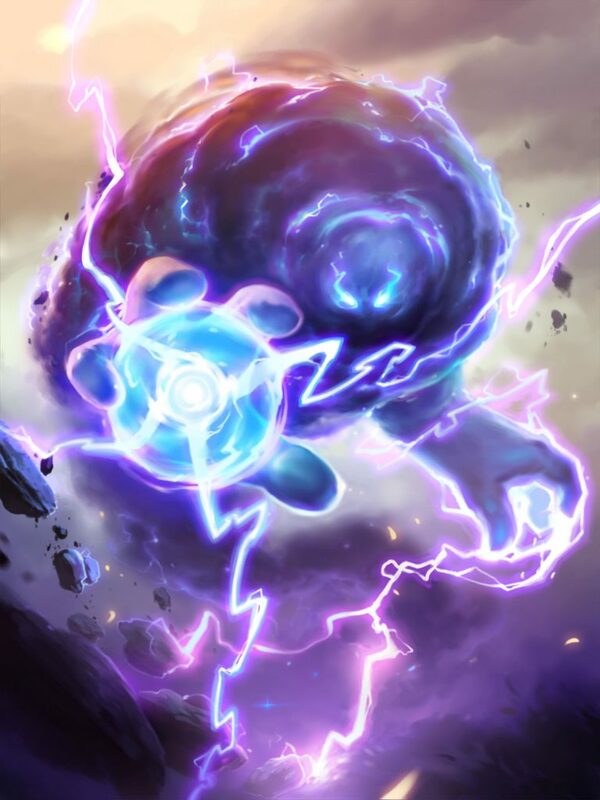 The deck runs a powerful area-of-effect damage package with two copies of both Maelstrom Portal and Lightning Storm. They help stabilize against board-centric decks such as Midrange Paladin, Token Druid, and Zoo. I also experimented with Volcano, and it was a great comeback tool if I lost the board in the mid-game, but I ended up cutting it and trying to use the smaller spells and not fall behind so much. 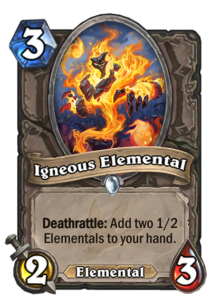 The list is heavy on token generation: Fire Fly (perhaps the best one-drop in the game right now), Igneous Elemental (that I doubted for a long time, but comes in handy in this token-based approach), and Stone Sentinel are cards that can generate board presence quickly. When you have board presence, there is one obvious big finisher: Bloodlust. Bloodlust has won me a ton of games. I originally teched it into the deck against Taunt Warrior, but it can also help against Quest Rogue moments before they gain board control. 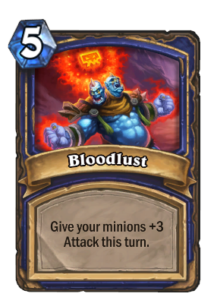 Still, I think running one copy is enough: having no minions but two Bloodlusts in hand is a terrible feeling. 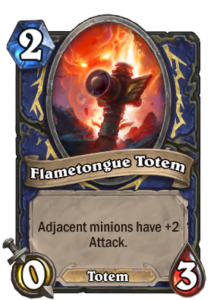 With this more token-based approach, Flametongue Totem is a key card, and it is often great in the early game as well, as Fire Fly has more chance of survival than I expected with a number of one-attack minions around. 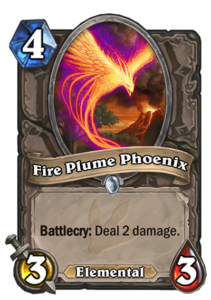 Flametongue Totem can help with early trades with Fire Fly and Tar Creeper, and it is of course very good later in the game when you have multiple tokens on the board and can chain them with the Flametongue Totem buff. Elemental Shaman has limited card draw. 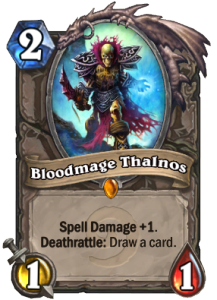 In this list, there is Bloodmage Thalnos that can also help buff up the area-of-effect damage spells and one copy of Mana Tide Totem. 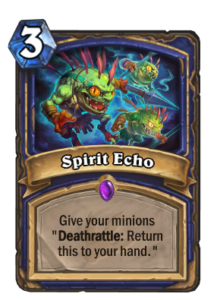 I have also experimented with Spirit Echo, a card that gives your existing minions a deathrattle to return to your hand upon being destroyed, and it is a promising card that could definitely see play in an Elemental Shaman list. 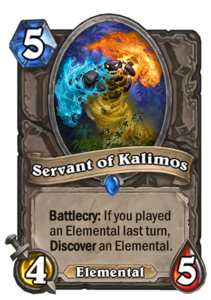 In addition to card draw, there is also some resource generation in the form of Servant of Kalimos. The Servant has actually turned out to be the most powerful card in the deck. It often offers you another copy of Kalimos, an Earth Elemental, or Al’Akir the Windlord, and it can also offer another copy of itself, creating yet another card as you get a new pick when you play that one. 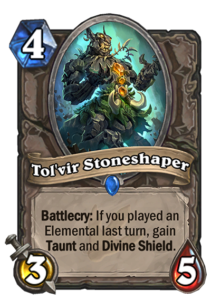 Another option for further resource generation is Stonehill Defender, which has a good chance to offer you another Shaman Elemental, as Hot Spring Guardian, Earth Elemental, and Al’Akir all have taunt. It is good in the mirror as well as against Midrange Paladin and Taunt Warrior, but not so good against more aggressive decks so I chose not to include it in this list. Elemental Shaman can play a lot of taunts. Turn three Tar Creeper into a turn four Tol’Vir Stoneshaper is a powerful defensive play. You have many options to choose from, and the right choices depend on the meta. If you want to be the aggressor in a long value-based matchup, Hot Spring Guardian and Stonehill Defender are more useful than Tar Creeper and Tol’Vir Stoneshaper. However, if you are facing a lot of Pirate Warriors, the taunts with higher health and more attack on the opponent’s turn can help you survive better. 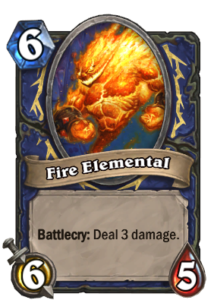 Elemental Shaman has a ton of minions that have a direct effect on the game when played: Fire Plume Phoenix, Fire Elemental, Blazecaller, and Kalimos can all deal damage when played and allow for big potential swing turns. The meta is still evolving, so these are quite hard to predict for the long term. Nonetheless, some observations on the current meta can be made. Pirate Warrior is a favored matchup. With the defensive list, you can often survive their assault and stabilize. If they have no board when you drop a Stoneshaper, getting past that Divine Shield can be frustrating. To get there, you need to survive the early game. Fire Fly and Maelstrom Portal are the two most important cards to keep, and Flametongue Totem can also help if you have some early minions to go with it. Taunt Warrior is an unfavored matchup. You need to be the aggressor and build one board after another and try to push for that damage. Look for a good minion curve; area-of-effect damage is not important early on here. Tar Creeper can be good to defend your minions and it can also attack if you find a Flametongue Totem to go with it. Hex needs to be used for tempo, and Kalimos is often six damage to the face, as Warrior has so many ways to clear a board of 1/1s. Once he uses Sulfuras, the Warrior can only heal with Shield Block. Therefore, if you have enough health left, you may be able to use direct damage effects on the Warrior’s face and win through that. If you’re still missing a bit, try to go wide on the board first and then finish off with direct damage. Quest Rogue is an unfavored matchup. 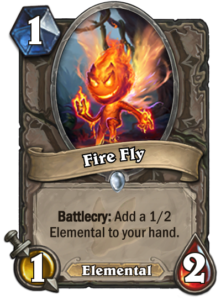 Look for early game: Fire Fly, Maelstrom Portal, Flametongue Totem. If you’re on the coin, playing both Elementals from Fire Fly with the coin into a Flametongue Totem on two can help you get off to a good start. 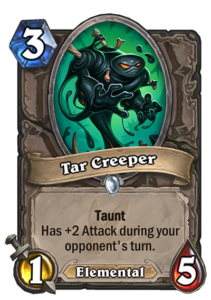 Tar Creeper can also help by protecting your damage dealers. You need to get the Rogue low enough so that you can race him when he completes the quest. Focus on face damage, smart trades on the best bounce targets (Novice Engineer, Swashburglar), and if necessary trading a bit just before the quest is completed to buy more time. 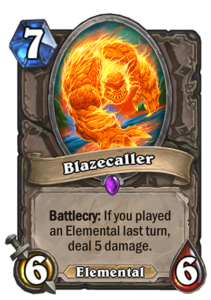 Fire Elemental, Blazecaller, or even Kalimos with six damage to face can close the game. Midrange Hunter is a favored matchup. 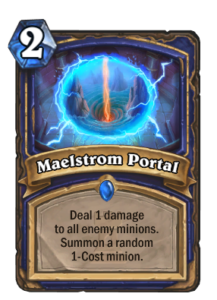 Look for early game again, especially Fire Fly and Maelstrom Portal. If you have no other way to remove Hunter’s minions, a turn two Maelstrom Portal (or turn one if you’re on the coin) is perfectly acceptable even on a lonely Jeweled Macaw: you really want to deny the possibility to play Crackling Razormaw on a beast on turn two. Even if things don’t go your way at the start, Lightning Storm and Hex can still bring you back into the game. Hex is best used on Savannah Highmane, but you are sometimes forced to use it on a big Scavenging Hyena. An interesting, quite even, and highly value-focused matchup. 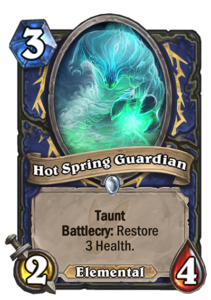 Most Midrange Paladins run some kind of Murloc package for their early game, as Hydrologist is such a good card. Thus, you will need to be able to answer their early game and then transition to a value-based game afterwards. 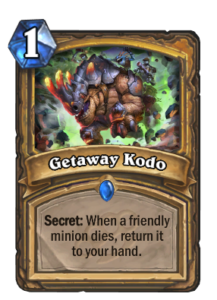 Paladin is most likely going to pick up a Getaway Kodo from Hydrologist, and save that to play with a big minion. 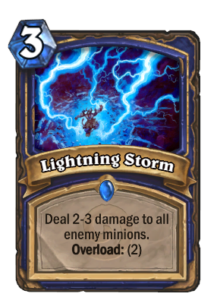 As Shaman, you have plenty of tools to deal with this: Hexing a minion before killing it returns a frog to their hand, and using one of the many battlecries to pick off a weak minion before going for the obvious target can give the Paladin an extra Silverhand Recruit instead of an extra Tirion. 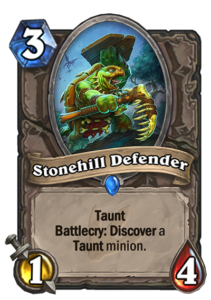 With Stonehill Defenders on the Paladin’s side, he can pick up extra class taunts in basically every game, so you may have to face two or three Tirions or Sunkeeper Tarims. 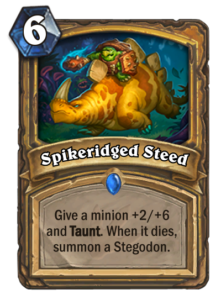 As Spikeridged Steed is also seeing a lot of play, there are more good Hex targets than you have Hexes in the deck. 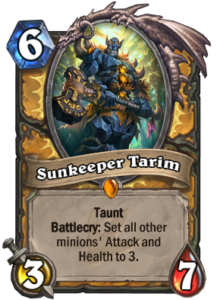 Try to pick your Hex targets carefully, depending on what other cards you have available to deal with rest of the threats, and remember that Sunkeeper Tarim can show up at any time to turn both boards into 3/3s. 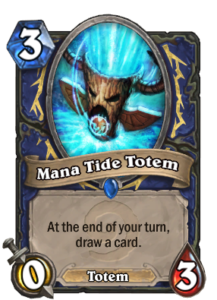 Elemental Shaman is a powerful deck when teched for the opposition you are facing. The problem is that teching for one matchup weakens others, so in the current meta you are almost forced to run some form of a compromise list. A fully anti-aggro Elemental Shaman is scarily strong against aggro, but takes a beating from Quest Rogue, Taunt Warrior, and Midrange Paladin. A list that adds the value needed to beat Taunt Warrior and Midrange Paladin falls before Pirate Warrior. Overall, the deck is good, but because it is difficult to build it to be consistently good against a varied field, it has some issues right now. 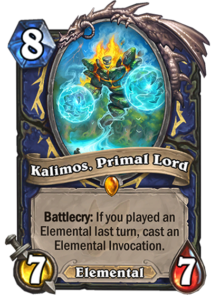 Finally, Elemental Shaman faces competition from within: many players opt to go for a Jade Elemental Shaman build that promises to strengthen the early game of the deck while still achieving late-game power with Jade Golems and selected Elemental synergies. I will explore that option in the next deck tech article. Previous Previous post: Zoo: Hearthstone budget deck is back!